Instantly post news and announcements on multiple game servers from any web browser! Announcements, new and old, can be read by players on the server at any time! Based on the stealth game by Ubisoft, CTs are agents of Third Echelon whos mission is to eliminate all the terrorists. This addon comes with a map (DarkArena) made specifically for splinter cell mod! Made for Hosties servers, allows CTs without a microphone to give commands. In chat, a ct types !c msg and in chat, in light green, *COMMAND CHAT* Player Name: Message will appear. See Pictures. 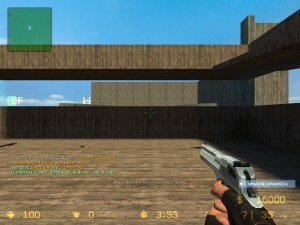 Inspired by Call of Duty: Black Ops Sharpshooter Mode, every player uses the same gun, guns randomly cycle every 45 seconds (default), unlimited ammo & deathmatch, player with the most kills at the end of the round (default: 9 minutes) is the winner.